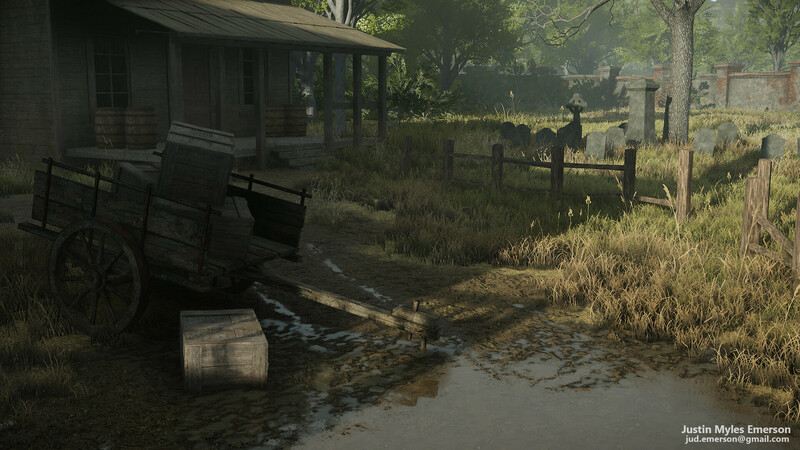 Environment Artist Justin Myles Emerson created a stunning Hunt: Showdown scene which he released to great acclaim on ArtStation. We caught up with Justin to find out more. Based in Maine, USA, Justin created a beautiful scene in CRYENGINE featuring medium poly modeling, vertex blended tiling materials and photogrammetry. There’s also an Easter egg in the scene if you can spot it… We caught up with Justin to find out more about how he created this amazing art. Hey Justin! How long have you been working with CRYENGINE? I started working with CRYENGINE in early March of 2018, so about a year. Why did you decide to use CRYENGINE for this project? CRYENGINE gives you the tools to help realize your vision quickly. Almost everything you need to create stunning environments is ready to use out of the box. Do you know that old art adage which states that eighty percent of the time spent on a project will occur during the final five percent? The faster I can get to the refinement stage in a project, the more time I can spend on making it look great, and CRYENGINE helps me do just that. 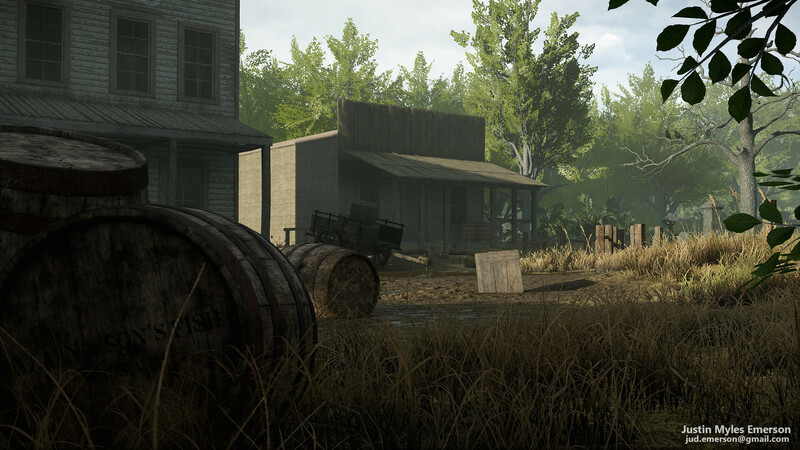 And of course, since this project was inspired by Hunt: Showdown, I felt it was paramount to use CRYENGINE to emulate the source material authentically. Why did you choose Hunt: Showdown as your inspiration? 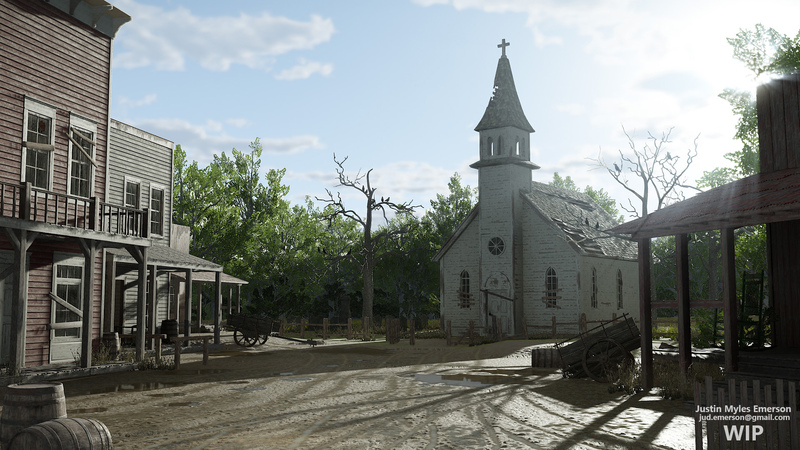 During the ArtStation Wild West challenge, I saw an entry by James Ross McNab which was also inspired by Hunt: Showdown. The moment I saw it I knew I had to base my next environment on his concept. I’m a huge Hunt fan. I’ve been playing and talking about it non-stop since it launched. It’s been gratifying to see the game progress throughout the year, especially the continued refinement of the art assets. The team’s work is a constant motivating factor for me. Hunt: Showdown has firmly muscled its way into my “Best Games of All Time” list. If anyone reading this hasn’t played it yet, I implore you to check it out. What was your workflow for creating the piece? 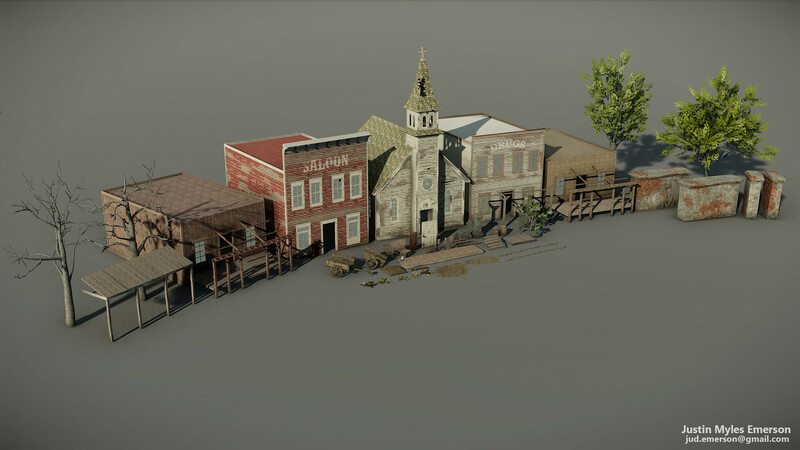 To emulate the environments in Hunt, many of the assets were made using the same development techniques, such as medium polygon modeling with custom-weighted vertex normals. In today’s games, textures are some of the biggest performance hogs, so texture reuse is incredibly important. The medium-density poly models don’t rely on unique textures for each asset, allowing textures to be shared between many models. While this workflow trades reduced texture load for increased vertex count in the engine, it reduces overall draw calls. Pairing this technique with decals and material blending reduces the likelihood of a viewer noticing texture reuse. Of course, some assets require more specific detail, and for those, I had to follow the traditional workflow. Notice how the bevels are smooth on the left pillar. This model has essentially one smoothing group but is shaded correctly because the vertex normals have been recalculated. No normal map bakes required! For comparison, the right pillar has not been recalculated. Which CRYENGINE features helped you to create the scene? It’ll be no surprise that the engine’s most powerful feature, SVOGI (real-time global illumination) played a huge factor. This technology allowed me to iterate on the lighting with ease. Also, the Road Tool was a huge help in creating the muddy wagon tracks. This tool is extremely easy to use and allows applied materials to automatically fade out on the last spline point, reducing the appearance of a sudden immersion-breaking transition. I used Terrain Decals in combination with the terrain painting tools to give me more control for rock textures on the mountains. I also used Volumetric Clouds to give the sky more depth. I can’t get enough of this feature. This scene shows how the Time of Day and Volumetric Cloud settings can be tweaked to set a specific mood. Do you have any advice to anyone using CRYENGINE to make scenes like this? Find something that speaks to you. You’ll be more energized to tackle the workload ahead, and your passion will be clearly visible in the end product. Now that you’re ready to create your masterpiece, here are some tips to help you along the way. I highly recommend creating detail maps for your assets to increase texture quality. Secondly, get to know your console variables (or CVARs for short). These are strings that change engine settings for many things which aren’t easily found in the editor, like the various anti-aliasing settings. Once you tune the settings to your liking, navigate to your engine install location and manually update the system.cfg file with these changes, so they will load every time you open the engine. Another handy trick is to right-click on an empty space at the top of the UI and select View Modes. This will populate the top of the interface with extra buttons that control different graphical buffers including albedo, reflectance, translucency, and specular validation. If something looks unusual in your scene, check these view modes to inform you of a potential problem. Get familiar with all of the modes in order to help maintain visual cohesion in your environment. Lastly, it’s imperative to seek feedback. I’m a member of an incredible community of artists called The DiNusty Empire, which was created by Jeremy Estrellado. Look us up and join today. You won’t regret it. What was your favorite part of the creation process? Experimenting with new workflows is always exciting. After watching William Vaughan’s Introduction to Fur Material in MODO, I began testing how that workflow could help me create grass textures. It worked rather well! William’s “Vaughan in 60 Seconds” video series is in incredible resource for MODO users. 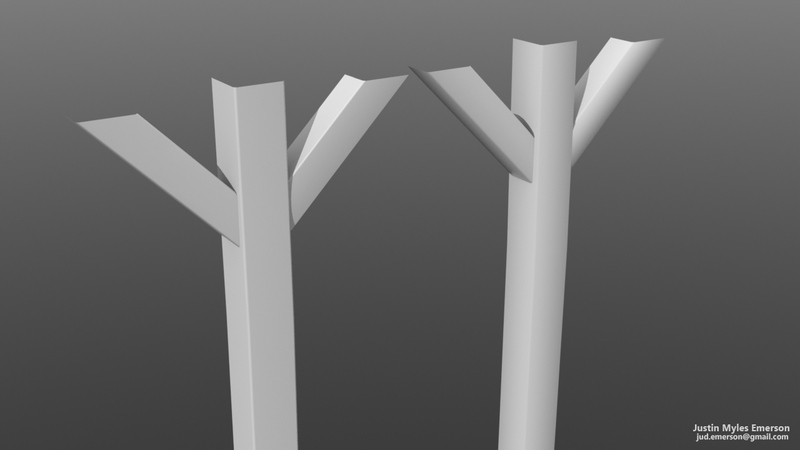 While I enjoy solving problems in creative ways, the refinement process is my favorite part of environment creation. Pushing myself to move the quality bar ever higher is often challenging, but always rewarding. Be sure to check out Justin's ArtStation page for more fantastic pieces. Are you making something cool with CRYENGINE? Let us know in the comments, on the forum, or via Facebook, and Twitter. Don’t forget to join the community and our CRYENGINE development team over on the official CRYENGINE Discord channel. This looks excellent! Its really rare to see a good stuff on this engine. I wish I could have a playable demo with this scenery. Good work, keep it up man! Great job my friend, keep it up.